I’ve been helping a client move their website from their existing host to a new one, as their old host is closing down. This was quite straightforward once they’d decided to only move the site I had written the code for, not another which was a complicated unknown entity. The only wrinkle was they have a secure certificate to give them an https connection and we had to register a new certificate as part of the move. I did this through their host at their request, but hadn’t realised that most SSL certificates are specific to the domain, including the sub-domain. This was a mistake as they used the ‘www’ version of their address for their website, and I registered the new certificate for the non-www version. The only further foible was as this was an existing site, Google had indexed the site, and shows the https version in the search results, even though the home page is not explicitly https. Now, because it points people to the https://www version of the site, it shows an unsecure error before showing the site, because the certificate isn’t valid for that on the new site. All this means – searchers go to the old host so no security warning, then get forwarded to the new host while we wait for Google to respond to the preference change. I hope it comes through quickly. And now I’ll go back to my scheduled work a wiser, if more tired, man. This entry was posted in Clients and tagged security, ssl on August 25, 2016 by Paul Silver. Recently I carried out my first integration to the new (to the UK) payment processing provider Stripe. My client Jasper Goodall was looking at moving to Paypal for taking payments and having integrated with Paypal in the past, I suggested Stripe as a more developer and client friendly alternative. He liked the look of Stripe and signed up. My local PHP 5.2.4 install didn’t have mbstring on by default, so I had to install it. This was on my Windows PC so I had to move the mbstring DLL in to the main ‘php’ directory and edit the httpd.conf file to include the DLL as one that needed to be loaded. I then restarted Apache and it was working fine. My host did have mbstring turned on, so I didn’t need to change anything there. My client didn’t have a certificate to allow his to use SSL. However his host, Claranet, had a shared secure area that all of their customers could use without requiring their own certificate. This was good, but I had to re-code parts of his site so things like the stylesheets would load properly when using this area. If you or your client are on shared hosting with one of the larger providers, it’s worth checking to see if they have a secure area you can use before investing in your own certificate. This can save you some money, but has the disadvantage that the URL of your secure pages won’t show your domain in that part of the website address, which may make some customers suspicious. It will be worth adding some text to your pages explaining how they are secured if you think that is going to be a problem. Previously, we were using Sagepay which takes various information about the products in the customer’s basket and builds an e-mail notification of the sale for you. Stripe just take the amount of money you are charging, so I had to update the website to create a notification for the customer, and one to tell the client a sale had been made. These were very simple additions to the post-sale process. Overall, Stripe was a delight to integrate with. I’ve set up shops using several payment gateways – Sagepay (was Protx), Worldpay, Secure Trading, Paypal, and Paypoint. Stripe was by far the easiest, taking only a few hours to integrate with including the bug fixing of my setup and the re-coding of the existing shop to send the right information through and use the extra secure area of their hosting. If you were starting from a cleaner base, you’d probably be looking at an hour or two including reading the documentation. Really nice. This entry was posted in Clients, Code and tagged ecommerce, php, stripe, taking payments on October 14, 2013 by Paul Silver. 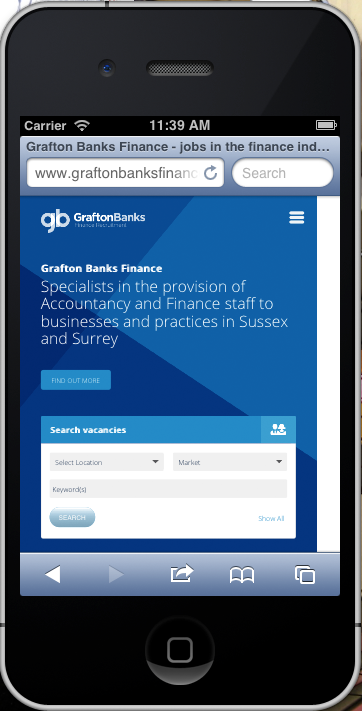 Over the last few weeks I’ve been re-building the Grafton Banks Finance recruitment website. I’ve been working with them for many years, maintaining and extending the previous version of the site, which was frankly long in the tooth from their beginnings, being based on another site from within the same group. The graphical side was adroitly handled by Nick Carter, and as ever he came up with the goods – a great looking site the client is happy represents them properly. The team at GBF were nervous about being able to work with Nick as this is outside their field of expertise, but he did a great job in guiding them through what they needed to think about, and then interpreting their brief. The site has a mobile-friendly version via Media Queries within the CSS controlling the layout of the site. It is not a fully ‘responsive design’ which would cope with all sizes of screen due to time constraints, the mobile version targets iPhone’s specifically, but also looks fine on my lower-end Android handset after an extra screen tap. This is another area I need to improve on, the conversion process only had some small hiccups and some friends in the Farm were happy to point me in the right direction to fix things, but I could have avoided the problems I was having with more experience. Some conversions of my own sites will give me some much needed practice in these areas. Although I my own process with the work on the site could have been smoother, I think the end results for their business are good. 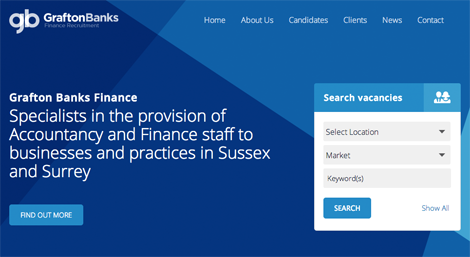 The team at Grafton Banks Finance are lovely people, and I’m happy to have been part of building them a website that reflects their company and values properly. Check out the site here. This entry was posted in Clients on September 12, 2013 by Paul Silver.